The research team operating in the Laboratory of Infrared Spectroscopy, is engaged in the application of FTIR Miscrospectroscopy and Imaging to the structural study of various materials, organic, inorganic and biological ones, in different physical states. This spectroscopic technique, based on the interaction between matter and infrared radiation, which causes vibrational transitions in chemical bonds, let achieve a deep analysis at molecular level of the samples. 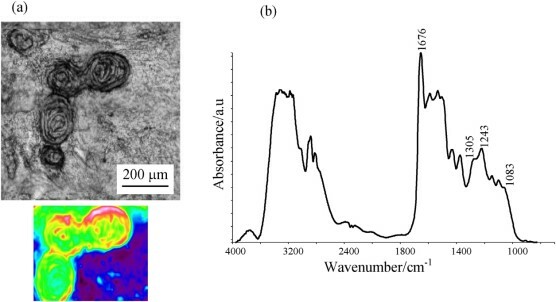 The coupling between IR spectroscopy and Vis microscopy let also acquire IR maps on non-homogeneous samples, in which each pixel represents an IR spectrum. In the biomedical field, tissues and cells can be successfully investigated. 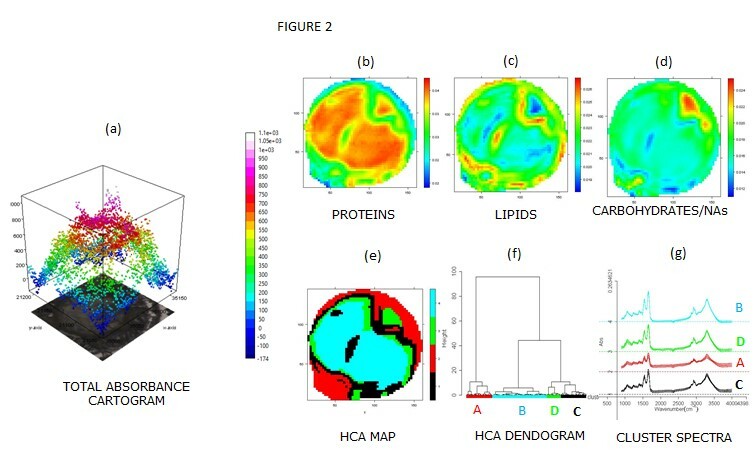 The analysis of the spectral data provides important insights into the fundamental spectral signatures of the biological samples, performing a biochemical screening of the whole cellular macromolecular building (proteins, nucleic acids, lipid and carbohydrates) and of specific metabolic processes. 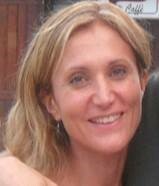 The huge number of data acquired on a single sample, requires an appropriate statistical and multivariate treatment. - IR mapping of living cultured tumoral cell lines and analysis of the damages induced by various treatments, such as heat shock, oxidative stress and chemotherapy drugs. Study of the cellular macromolecular building and metabolism. 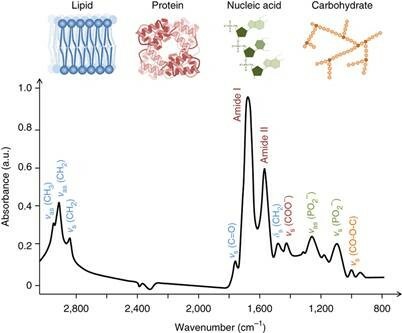 Detection of the modifications ascribable to lipids, proteins, sugars and nucleic acids. - FTIR microscopy characterization of human gametes: analysis of oocytes, spermatozoa and follicular cells in patients involved in in vitro fertilization protocols. 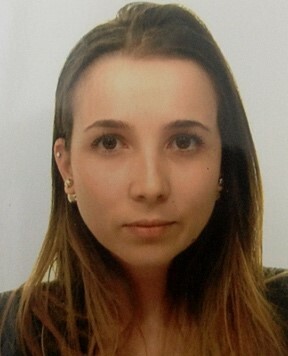 - Evaluation of the degree of polymerization and purity in dental materials for restorative purposes. Analysis of the biocompatibility and of physical and chemical features of composites. - Vibrational investigation on the effects of b and g ray sterilization on biocompatible polymers for medical application. 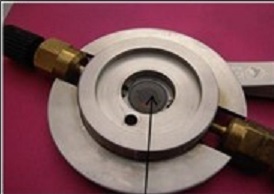 Analysis of the mechanical and chemical modifications due to irradiation. - Qualitative and quantitative analysis of polymers (SBS and EVA) in modified asphalt. Study of aging materials. - Characterization of composite materials (roof tiles, bricks, cement, etc.). 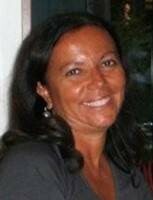 Dipartimento di Scienze e Ingegneria della Materia, dell’Ambiente ed Urbanistica (UNIVPM), Dipartimento di Scienze Biomediche e Sanità Pubblica (UNIVPM), Dipartimento di Scienze Chimiche (UNIBO), Dipartimento di Scienze Chimiche (UNICT), ELETTRA-Sincrotrone Trieste, Tecnobios Procreazione Bologna. - structural analysis of building materials. 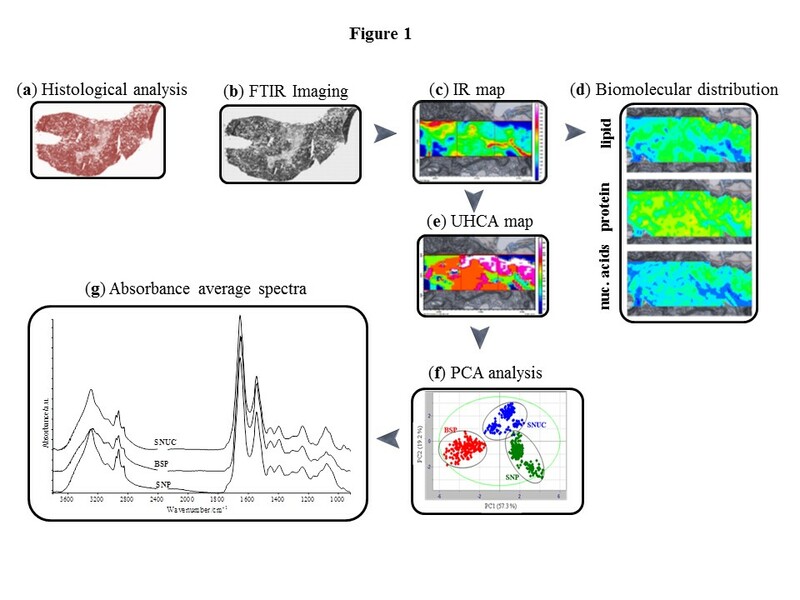 - Software packages for data treatment: Spectrum 10.4 and Spectrum AutoImage 5.1.0 (Perkin Elmer); Pyrouette 4.5 (Infometrix), Grams AI 9.1 (Galactic), Opus 7.1 (Bruker), CytoSpec 2.00.01 and HyperSpec.